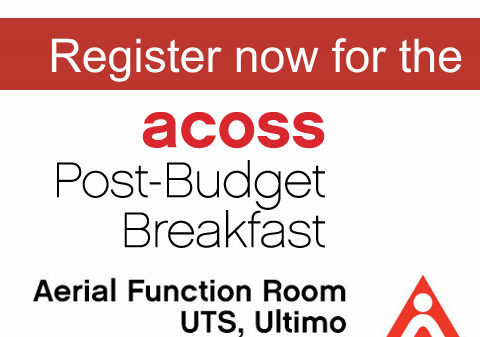 The ACOSS Post-Budget Breakfast provides a critical opportunity to come together to discuss the impacts of the federal budget from the perspective of the community services sector, civil society and people experiencing poverty and inequality. Join ACOSS CEO, Cassandra Goldie, a dynamic panel of high profile commentators and fellow representatives from civil society for a robust discussion as we move beyond politics and short term analysis and apply a focused, critical lens in four key areas of Budget scrutiny: poverty and inequality, climate change, community services and housing affordability. Tickets include à la carte cooked breakfast, fresh baked pastries, coffee, tea and juice, thanks to the generosity of ACOSS Platinum Partner, the University of Technology Sydney.